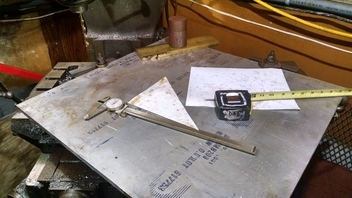 Yeah, my plan is to do the bare minimum of cutting to test the fit, which means the two engine dowel holes, the two transmission dowel holes, the large clearance hole for the counterweight, and a slot inside the scrap envelope that I can use as a datum. 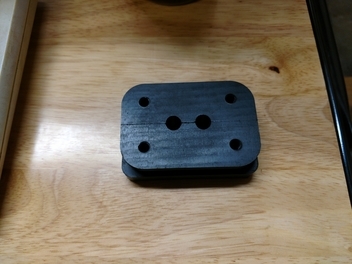 Once the dowels are verified, I can re-indicate using the slot and one of the dowel holes, punch the rest of the mounting holes, test fit again, and leave it at that till I can get some time to do the inside contours. I have a good margin of excess space around my outline, and I'm planning to keep the outer contour as the last thing I machine. 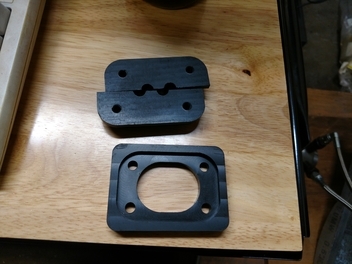 I still haven't 100% nailed down if I want to use the plate as part of a motor/trans mount, accessory mount, or some such, and would like to leave those options open. My plan is to start plugging away at this again sometime this month, and get the powertrain sorted out at least to the outer CV shafts by the end of the year. 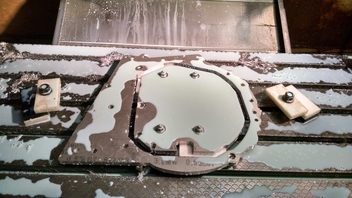 Took the big plunge Friday night on the adapter plate, and decided to start machining it without the aid of a DRO or CNC mill. I didn't get many photos, but such is life. 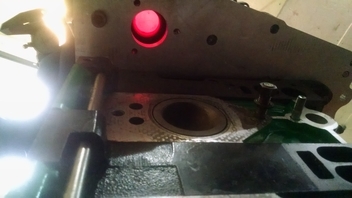 The two engine alignment dowel holes are counterbored and countersunk, along with one of the transmission dowel holes. 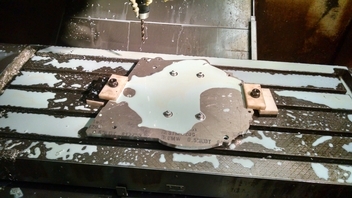 The remaining transmission dowel hole couldn't be machined in the first op, because I had stock to machine interference. I'll be reindicating off the engine dowel counterbores and the transmission dowel hole to punch the last one, and possibly spot drill some of the non criticals. Clamped down in two places only, but the weight and surface area of the plate helped keep it from moving about. You can see the brass and steel stock used to counterbalance the massive overhang. 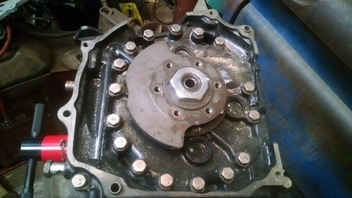 Transmission side, showing one of the countersunk flat socket heads that bolts the engine down. This all sounds like a terrific build. Glad to see that you will make a coupé with gullwings. Not an easy task. For my second build I am trying a coupé as well. Not sure whether I will go gullwings. My thoughts come and go. At this point I have parked the door issue as: two light removable doors that can be stowed away somewhere on the car in most situations. The car being designed as a fair weather fun thing with an added degree of comfort over my previous one which is a spartan seven with Brooklands aeroscreens. Looking forward to follow your progress. Smoked a 3/8" collet due to reduced clamping area, and not catching a CAM screwup. Somehow the tab cutoff operation was posted out before the inner contour, and I didn't catch it. You can see the aftermath as a big U-shaped badger bite in the lower left hand corner. Things would have been peachy, but the tab cut operation was full-depth, and I didn't have lead-in/lead-out disabled, because I didn't expect it to post. 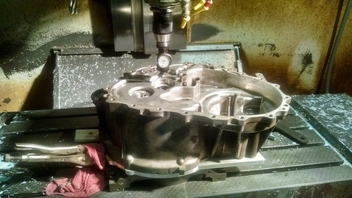 Live, learn, buy another collet. Next step is some holes for the driveshaft brace tube, and then I can call it finished. Has Bubba been moonlighting at your shop? Wondered where he had wandered off to... Didja feed him? Or is that why he came home? He may be, emphasis on MOON-lighting! Asin'z yaz can seez from the badger bite, I think he acquired a new taste for 6061-T6! Checking engine to trans bore alignment. I'm off by about 0.024" radial, which puts me right in line with the accuracy limits of the measuring tools I used when I made the original model. 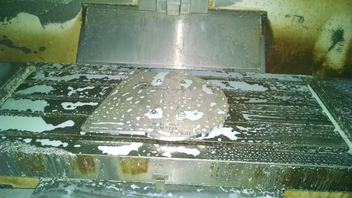 I'm hoping it doesn't cause any major problems, and the springs in the clutch disc adsorb it. 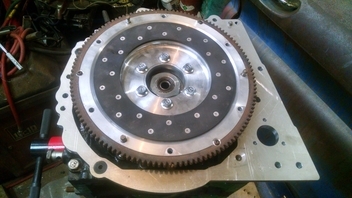 New plate goes on, flywheel goes on. Looking up at the jackshaft clearance hole. Now to the jackshaft brace, brace tube, then the dry sump plate. 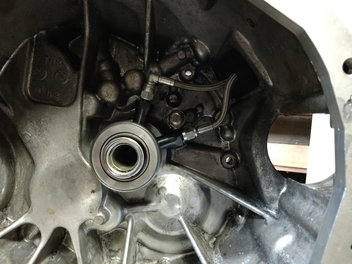 Regrettably, I will not be able to run the OMP, since the CV axel joint on the jackshaft takes up all the room for it. No real progress, just part and tooling acquisition. I found out that the front cover from the 13B-MSP out of the 04-08 RX-8 will fit on the older 13B-DEI engines with some minimal modifications. 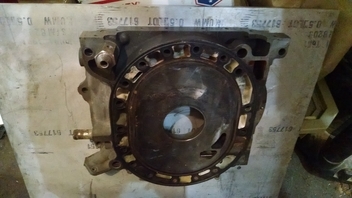 That gives me an integral water pump and thermostat housing, eliminates the distributor drive hole, and more importantly moves the OMP up and out of the path of the CV jackshaft. I ordered a used one off ebay back in February, but haven't had a chance to do the modifications to it. 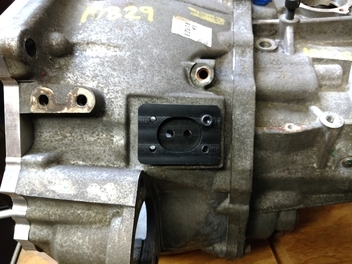 I'll also need to add in mounting bosses for the FD RX-7 style crank sensors in order to keep the factory ECU. That will require a custom front pulley and trigger wheel, since there isn't an aftermarket option that fits my needs. I also bought a 384K memory expansion board for the FADAL mill this past week, should arrive this Friday and be installed by Sunday. 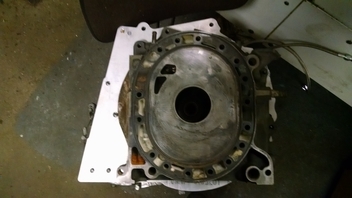 The revised and improved dry sump plate will have to wait till the front cover swap is complete, since the Renesis one has a different bolt pattern for the oil pan. Zero work done on the chassis design, since the powertrain still isn't finalized to measure off of. Made a delrin clamp for the braided lines on my release bearing. 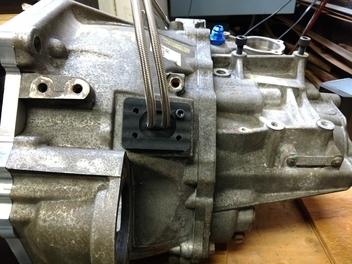 Three M4 socket heads hold the main inner clamp block onto the lines. 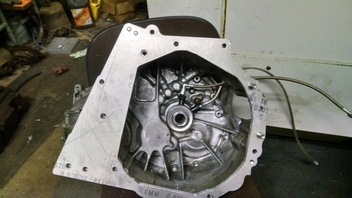 The outer retainer is a snug fit over the clamp block, and holds tight into the old clutch fork hole in the transmission. Four M6 socket heads clamp them together. 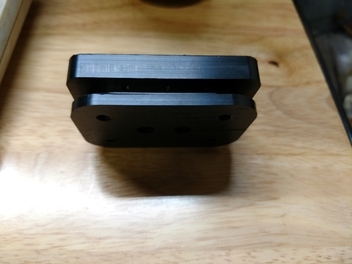 I also have some progress on the jackshaft brace, but forgot to take photos. The local junkyard has a burnt out 05 Maxima 6 speed, which I may harvest the shifter and cables from, along with some clips and harness connectors if they are intact. EDIT: Removed sig from post. Last edited by 300D50 on October 4, 2017, 10:51 pm, edited 2 times in total. Tonight I clamped the lines in final position and fed them through the transmission. I just need three more socket head cap screws or four socket head button screws and I'll be able to call it final. 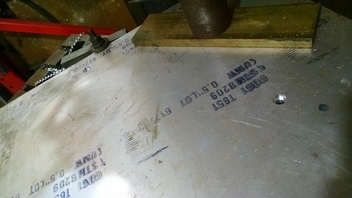 The hot rod sites suggest misalignment should be 0.010" total. Can you use some kind of offset dowels to shore it up? Pretty fancy work on the Delrin clamp - nice idea. 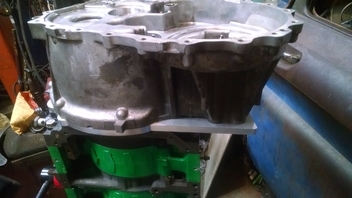 The plan is to do the final alignment check with the transmission housing on the built engine, then re-bore the dowel holes on the adapter plate to 11mm in the proper spots to remove the offset. Then I can machine a set of 11mm-9.5mm stepped dowels and press them in. Thanks! 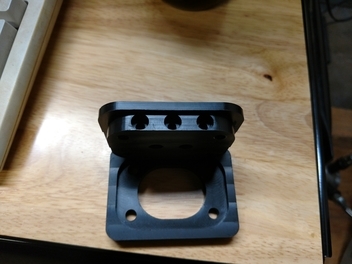 I figured it was a cleaner look than P-clips on a bracket, and it addressed the issue of closing up the hole. I know a few more of these will pop up in the build once the other lines need to be routed. 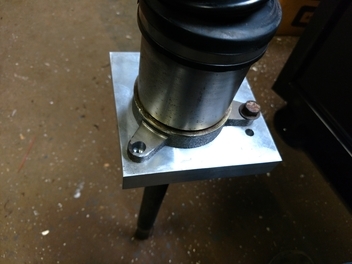 I rebored the jackshaft brace to be a slip fit on the CV bearing carrier and tapped the mount holes to M10x1.25 yesterday. I found out that I goofed when I made the model of the CV assembly, the holes in the bearing carrier were clearance for M8, not M10. What I think happened is that the hole size was close enough to 8.75 mm (tap drill for M10x1.25) that I noted them down as M10x1.25 threaded, then noticed they were clearance and put them as M10 clearance. In the end, I just drilled the bearing carrier for M10 clearance and called it a day. 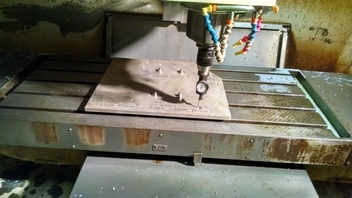 Next order of business is to get the outside profile milled.